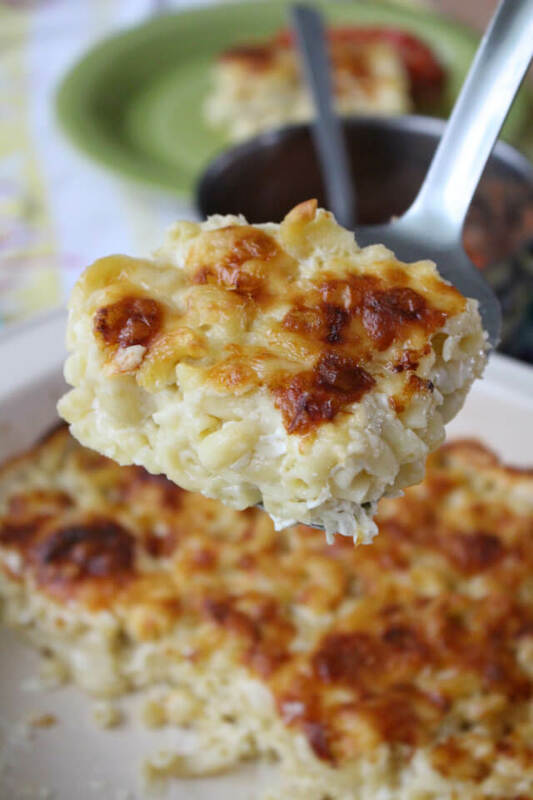 Momma's Baked Macaroni and Cheese is the easiest to make and absolute best mac and cheese recipe ever! Don't forget the stewed tomatoes! This is my favorite meal. Like favorite favorite. 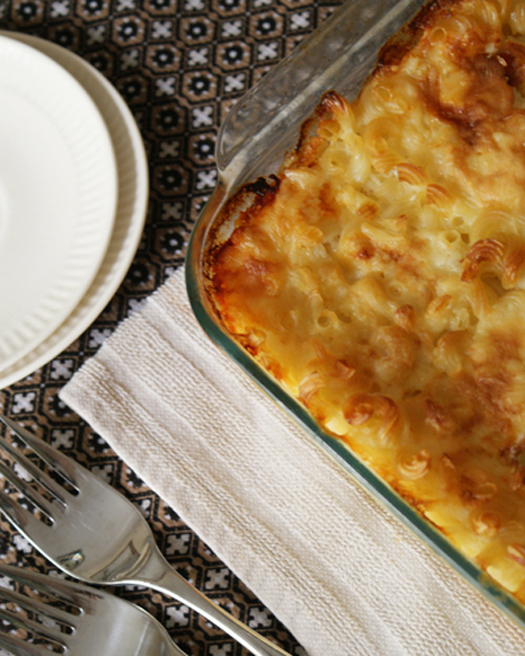 One of the special things that my Mom did for me and my three sisters every year on our birthday was to cook the meal of our choice for dinner, and every year without fail, baked macaroni and cheese was my request. No boxed stuff for this girl. Mom makes it like no one else I know. 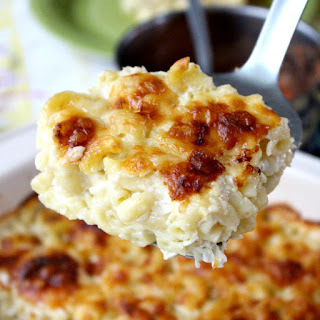 Sharp white cheddar layered between elbow macaroni that's baked for just an hour. The top bakes to golden perfection with little pieces of crunchy pasta (the crunchies!) peeking through the hot, bubbly cheese. Last time I checked, you don't get crunchies with the box stuff. 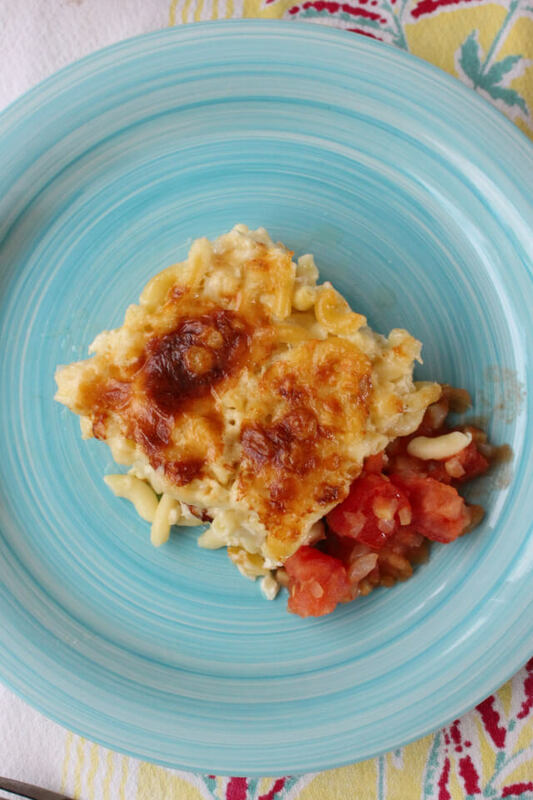 What really sets this macaroni and cheese apart from the rest is the stewed tomatoes. You absolutely positively can't have Momma's baked macaroni and cheese without stewed tomatoes! The majority of people that I've come across haven't thought of tomatoes as an accompaniment to their mac and cheese. I know it may sound a little odd, but I assure you, it is the only way to go. They are like the yin to the macaroni yang. At least for this recipe! So, don't skip 'em, even if you're skeptical. I've enjoyed many a mac and cheese in my 33 years and Momma's is, and will always be the best. I hope you love it as much as we do! So easy, no roux, no block of processed cheese. Just a few quick layers and you're done. LOVE! 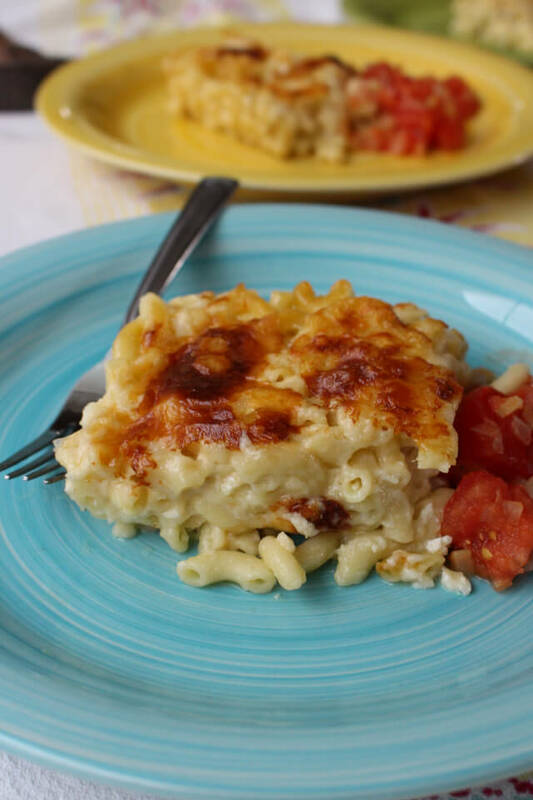 Momma's Baked Macaroni and Cheese is the easiest to make and absolute best mac and cheese ever! Don't forget the stewed tomatoes! 3. Top with sliced butter. 4. Pour milk over layers until the milk fills the dish about ¾ of the way full or until you just see the milk coming through the macaroni when you're looking at it from the top, about 3 cups. 5. Bake uncovered in preheated oven for 1 hour or until the top is golden and bubbly. Let sit 10 minutes before serving. Serve with warmed stewed tomatoes. Sharp cheddar works best for this recipe. Orange cheddar will work, but Mom always used white. Depending on the size/shape of your pan, the amount of cheese needed can vary between 1 lb - 1 1/4 lb. Photos updated June 2017. Here's the original! What do you do with the tomatoes????? I put a big spoonful of them right over the top of the macaroni and cheese. Then just a little salt right on top. It is served as a side dish. I see the tomatoes are actually not part of the recipe! Sorry. Oh, they are very much a part of the recipe! I never serve this macaroni and cheese without the tomatoes! My mom always added the tomatoes to the mac & cheese mixture before baking. YUMMY!! I've seen it that way, too. Haven't tried it that way yet! You don't make a white sauce and melt the cheese? Seems like this would be very dry. Sorry, not for me. Before I clicked on the recipe she posted that the stewed tomatoes were served on the side. My husband likes them on the side, I like them on top. Either way, just make sure you include them! OMG!!! This is how MY mama made mac and cheese!! Except it was yellow sharp (or extra sharp!) cheese. I never see others cook it this way! I have no idea anything about the "sauce" people make for mac and cheese!! This is also my favorite meal!!!! it when I was a kid and I am 84 yrs. young. How much milk do you use? I have never measured it in a measuring cup. I just pour it straight from the gallon until it's about 3/4 to the top of the macaroni. I will measure next time and edit it into the post! Our favorite meal for a large family in the 40's and 50's - Never grew to like the creamy sauce kind, but my mother always used long-horn cheese and I don't use any other kind. Totally different taste and so crunchy and cheesy! Is it 5 tablespoons of butter or 5 tsp as listed above? Thanks! 5 tsp, but you really don't have to be exact. Just as long as you put 5 little pats of butter on the top before baking it, you're good. Thank you for the recipe Becky. This mac and cheese recipe is exactly the way my grandmother taught my mom to bake it and I had a difficult time finding it online. My grandmother was baking this recipe in the 1930's and my mother was still making it in the 1970's but the recipe was never written down. I am a huge fan of stewed tomatoes and will add them as a side - a new twist for me. Thanks again !! You are so welcome! I'm so glad you ended up here! I think you'll love the stewed tomatoes. I love that your family has enjoyed cooking mac and cheese this way for so long! 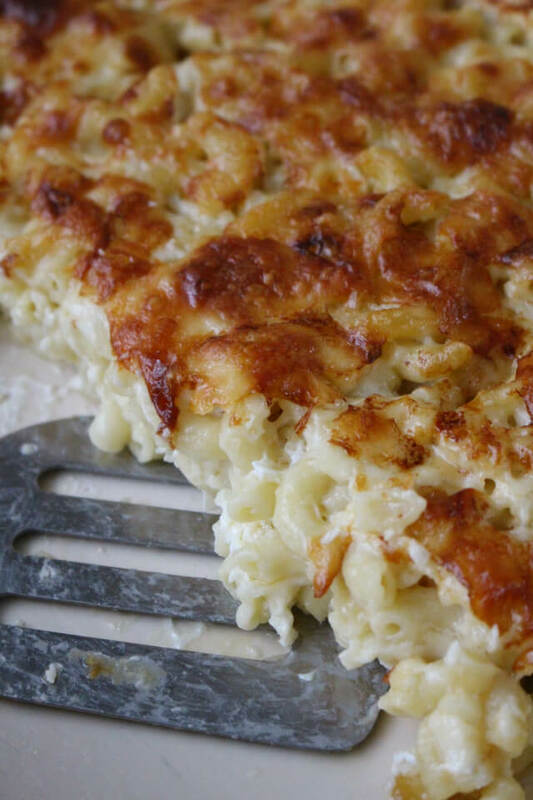 This recipe is the way I have always made my Mac and cheese. I wouldn't make it any other way. It's your basic Mac and cheese and so delicious! And it couldn't get any easier! I still continue to make to this very day!love it! Thank You for the recipe Becky. My mom made mac and cheese the same way but layered it in s Pyrex bowl. Still tastes the same. The addition of a side of stewed tomatoes is fantastic. Growing up threw the 1960's and 1970's this was a complete dinner. As I entered my twenties in the 1980's it was still the same. I guess today it is not good enough for the snowflake generation. This was also my mom's recipe for mac and cheese except we used sliced american cheese or during times of struggle, "welfare cheese". She also crushed up saltine crackers over the top of hers. Absolutely yummy and now what I'm making my family for dinner tonight!